Here it is, Mister Sea Perch. He is ugly on the outside but beautiful on the inside. It costs less than 5 NZD per Kilo and it's the king of the stock. You cannot find it everyday but yesterday he was there, waiting for me at the Seamarket shop, I couldn't resist its look, I bought two of them. Once at home, I washed them, cut the head, and separated the bones. I put the fillets on the fridge for dinner and used the rest of it for a fabulous "Caldo" or fish stock. You might be scared of cleaning a fish, but, believe me, it's easy, you just need a bit of time and maybe a good pair of fish gloves, that's all. Ok, now let's make our tasty "Caldo" or fish stock, vamos! Place all the ingredients in a pot with 5 litres of water and bring to boiling point on a high fire, taking off the scum in the meantime. Then pour a glass of cold water and bring to boiling point again, keep it like that for 30 min. Now you have to strain the stock by using a fine mesh strainer, you can also place a fine cotton cloth inside the strainer. Bueno, the "caldo" is ready. 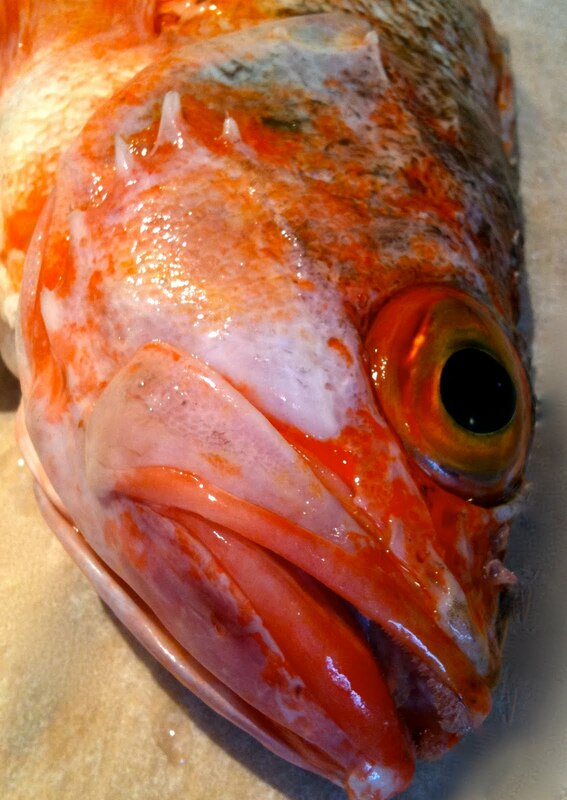 I am going to use it in a "Sopa de marisco" or fish soup, that will be my next post.